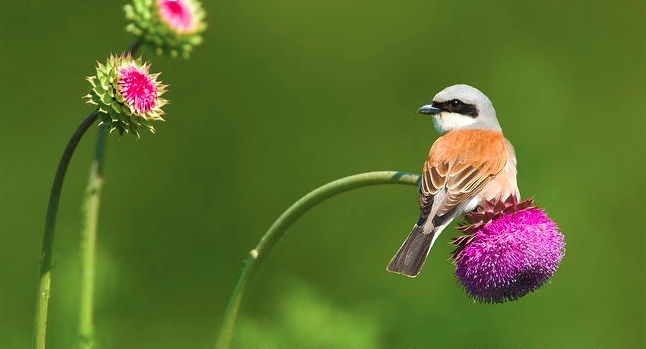 A male Red-backed shrike perched on musk thistle. Here is a video of this extraordinary behaviour, if you’d like to experience it prior to reading! A female Red-backed shrike tending to her larder. One of the greatest advantages of this impaling behaviour, is for attracting a mate. Impaling prey provides males with the opportunity to construct a grotesque display for females. Some species of shrike will decorate their victims, others offer her a gift from his stores, and some even perform ‘dances’! Although this impaling behaviour occurs in both male and female shrikes, it still plays an important role in sexual selection. Females prefer males with the most extravagant pantries, so the more a male can store, and the more diverse his larder, the more attractive he is to a female. Larder diversity is hypothesized to be indicative of foraging ability, a reasonable explanation for why females exhibit such a preference. 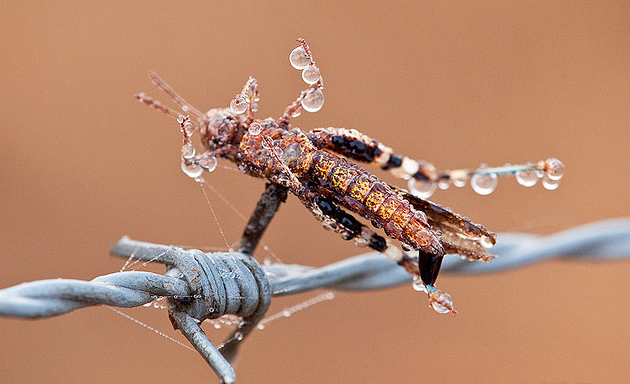 A grasshopper with aposematic coloration, that has been impaled on a barbed wire fence. Interestingly, females appear to also be attracted to brightly coloured organisms. In particular, organisms which exhibit aposematic coloration (coloration which warns of apparent toxicity). So, males will capture bright prey like bees and grasshoppers, and impale them to improve their odds. 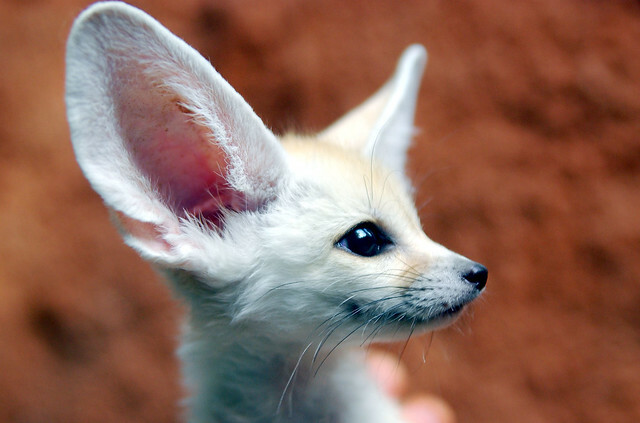 But, there is another advantage to impaling prey containing toxins: the toxins decay over time! So, with time, shrikes have actually managed to find a way to bypass the chemical defences of these organisms! 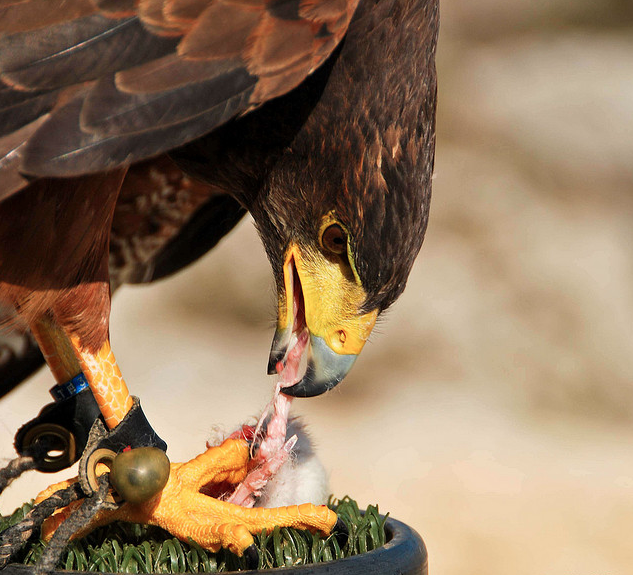 Most of the ‘birds of prey’ have well-developed talons which can be used to dismember and handle prey. Shrikes have to improvise! Aside from attracting a mate, and storing food, another advantage comes in the form of foraging efficiency. Because shrikes are passerines, they lack the strong talons that larger birds of prey typically have to dismember and handle prey. Therefore, shrikes had to be clever and improvise. 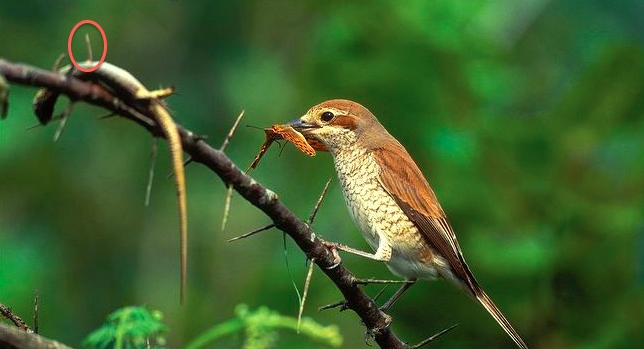 Rather than having a difficult time handling and tearing apart prey, shrikes use natural and man-made structures – such as thorns and barbed wire – as skewers to hold their food in place. Phylogram showing distinct convergent evolution between Shrikes and ‘butcherbirds’. Source: Fuchs, et al. 2012. One last thing that is worth noting, another type of bird called a butcherbird exhibits the same impaling behavior as shrikes. Often, shrikes are referred to as ‘butcherbirds’, but this is not accurate. 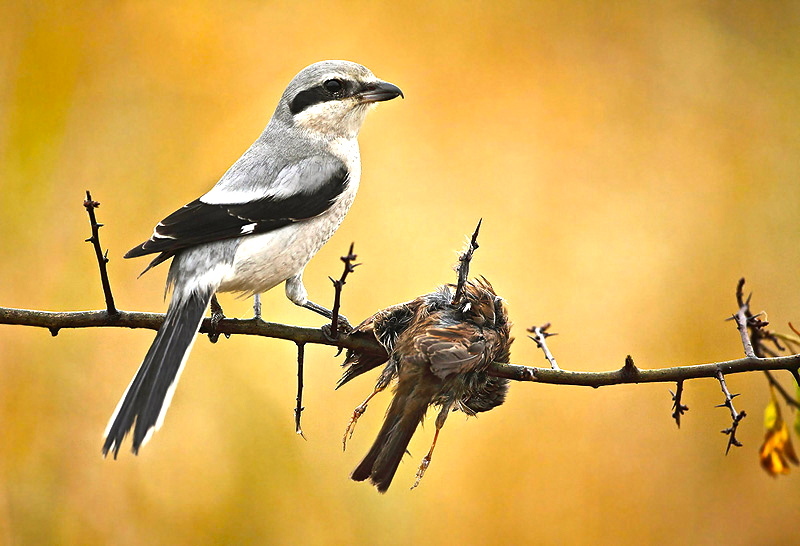 Shrikes belong to the Family Laniidae, whereas ‘butcherbirds’ belong to a different family, called Cracticidae. So, although they are similar behaviourally, shrikes and butcherbirds are evolutionarily distinct. A Northern Shrike, Lanius excubitor, a species of shrike we can sometimes find in Alberta.